I just finished watching an incredible documentary movie for the second time: Jiro – Dreams of Sushi is a story not to be missed by serious cooks, chefs, restaurateurs, artists, musicians, teachers and all who are seeking a calling in life. This is a incredibly beautiful, soulful, passionate movie that is an education in life demonstrating the importance of dedication to a craft, Kaizen (constant improvement), respect, consistency, being in search of excellence, partnering with others, beauty, rhythm of motion, the art of teaching, patience and completeness. The beautiful food that is produced in this landmark restaurant of 10 seats in Japan and the photography that frames this beauty is only a part of the message being delivered. It is a message for all who are seeking their calling or who think they have found it. What comes to mind is differentiating between those who seek to find a job to survive and those who find that purpose in life that makes them whole, gives them pleasure and provides a portal for expression that others want to emulate. The choice might be a chef, but could just as easily be a furniture maker, engineer, writer, musician, painter, writer, doctor, teacher or member of the clergy. One cannot underestimate the importance of work as an extension of a grand design. Jiro Ono epitomizes the cultural commitment to excellence in simplicity that has long been the standard of the Japanese culture. The movie captures this through the process of building partnerships with vendors of extraordinary ingredients, the reverence given to Nature’s bounty that is exhibited in the open markets of Japan, the exactness and care that Jiro and his staff take in the preparation of every product from the beautiful fish that they handle to the manner with which they prepare rice and even toast nori over a flame. The movement of each sushi chefs fingers are consistent with their touch on rice and fish, the care that they use in putting an edge on their razor sharp knives, the exactness used in determining where each guest will sit when they open and the orientation of plates and chairs designed to maximize their comfort and experience. Jiro learns a lesson of independence and work ethic much earlier than would be considered conceivable in our country and passes the knowledge from that experience on to his sons who are destined to take on his role when and if he retires. Jiro, at the time of the movie, was 85 years old and still working just as hard, every day of the year except for national holidays. He is the restaurant coach and mentor now, the master finisher of sushi and the face of the restaurant, but most importantly, the teacher of the next generation of Jiro sushi chefs who must commit to 10 years of apprenticeship before they are allowed to prepare any of the finished product for the guest. The beauty of Jiro and in this case – the movie, is to point out the value of strong foundational skills, the significance of tradition and the connection that a true craftsman must have with the ingredients and tools that they work with. 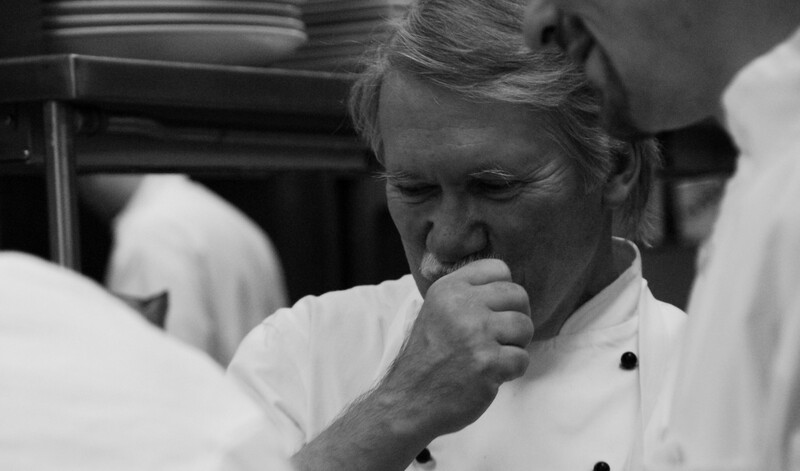 From a chefs perspective the lessons demonstrated by this master can and should be a guide for others to follow. Learning to build trusting relationships with vendors, building the highest standards of excellence and never wavering from those standards, taking every moment of every day to teach others, and always seeking ways to improve on your skills should be part of any serious restaurants method of operation. Jiro understands what it takes for cooks to master their trade and takes no prisoners when it comes to standards of excellence. He believes that a cook’s education never ends and includes all connections with the product and the experience. A favorite quote from the film is: “In order to make delicious food you must eat delicious food”, requiring all of his staff to eat the same excellent sushi that he serves guests who wait at least a month for a reservation. The palate is most critical if a chef is to master the craft. If you have not seen Jiro – Dreams of Sushi yet, then stop what you are doing and either purchase a copy (preferred so that you can watch it frequently) or place it in your Netflix Queue. If you are a chef or a restaurateur then please make this required viewing for every member of your staff: it is that good and that important.